Indulgent dark chocolate is combined with nutty tahini and crunchy almonds and millet for a great snack enjoyable all day long. 1 ounce coconut oil about 2 Tbsp. Preheat your oven to 375℉. Line a 9x9 square pan or other small casserole dish with parchment paper. In a large bowl, combine all of the dry ingredients, then spread them onto a large sheet tray in an even later. Toast the dry ingredients for 15-20 minutes total, stirring every 5 minutes, until the oats, nuts, and seeds have slightly darkened in color and are fragrant. Allow the oat mixture to cool slightly. While the dry ingredients are toasting, combine all wet ingredients in a small bowl. If your mixture seems too thick, add a couple of tablespoons of water or almond milk to thin slightly. The mixture should be thick, yet pourable. Combine all of the ingredients in a large bowl and stir to coat. Scoop the granola mixture into your parchment-lined baking dish, using a spatula to press the mixture down to flatten into an even layer. Bake for 20 minutes, or until the edges are golden. 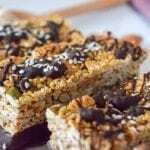 Allow the baked granola bars to cool completely. Once the baked bars are cool, transfer them to a cutting board and cut into even rectangles - you should get between 10-14 bars, depending on size. In a small heatproof bowl, combine the chocolate chips and the remaining coconut oil. Microwave in 30 second increments, stirring in between, until the chocolate is melted and smooth (this took me two 30 second periods). Dip the bottom of each granola bar into the melted chocolate, then place on a parchment-lined sheetpan. If you have any remaining chocolate, drizzle over the top of the dipped bars, then immediately sprinkle with sesame seeds. Refrigerate for 20 minutes, or until set.